I'm still behind in blogging, but there are still some things that I want to write about from early January (yes, 2006) before I start grossly glossing over details to catch up to the present. On Tuesday, January 10th, I got to enjoy one last day of vacation, even though my brother headed back home to Boston earlier in the day. It was gloomy, of course. It really seems as if 80% of my days off are gloomy. It's gloomy now. I guess if there's a chance of rain, I'd rather not have to go anywhere, so this isn't necessarily a complaint. 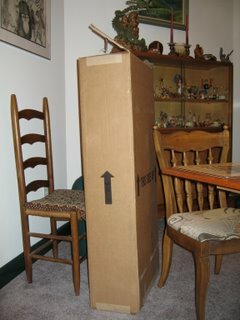 The most exciting thing of the day was that my new guitar arrived! I decided to get a 3/4 size Martin LX1 "Little Martin". Fed Ex brought it late in the afternoon and I was very excited. This was dampened somewhat by the notice on the box saying that it should adjust to the temperature of the house for a few hours before opening the box. That was fairly agonizing. Fortunately, I had to go play "Madame Secertary" at the Durham FM Association meeting anyway. I need to write up those minutes today, too. JH was there and we scheduled a time that evening for his first transmission on his handheld ham radio. I rushed home after the meeting and was relieved to see that the guitar already had strings on it. That was one less thing I had to figure out immediately. I was and am *extremely* pleased with the guitar. It's just the right size and sounds great, too. I did take a brief break from looking at it to talk to JH on the radio. Since then, I've been practicing playing the guitar almost every day, and that's been cutting down on my blogging time just a bit. What, you didn't notice?? The night after the juggling party, we made my dad's crepe style pancakes filled with cranberry sauce. I tried adding the melted semi-sweet chocolate but the cranberries pretty much overwhelmed it. That night, we went to ACME Food & Beverage Company. I had a wonderful blue crab and goat cheese ravioli appetizer with a Northern Spy apple salad with gorgonzola, spicy greens and a minted vinaigrette. Strangely enough, I didn't feel like having dessert afterwards, so I had a decaf cafe mocha instead. The ravioli, in particular, was just superb. The next afternoon, we went to A&M Grill. Their barbecue is kind of sour and I wasn't in a sour mood, so I tried their fried chicken tenders. They were ok. I probably won't get them again, because I'll probably be sour. That night, we went to ACME for the second night in a row. Sunday night, I'd had a hard time decided whether I wanted the duck or what I got, so I knew exactly what I wanted. The duck, with tangerine sauce, was wonderful. My parents and I had an apple cobbler to finish it (us) off. You really can't beat going to ACME two nights in a row. Now that I've spent too much time updating my picture for this blog and my website today, I'll continue writing about last weekend. Last Saturday, I spent most of the day cleaning up my house making rolls and coconut macaroons, in preparation for The Juggling Party. Once AE, KD, GM, JH and IS arrived, we started out by playing with my Geomag sets. 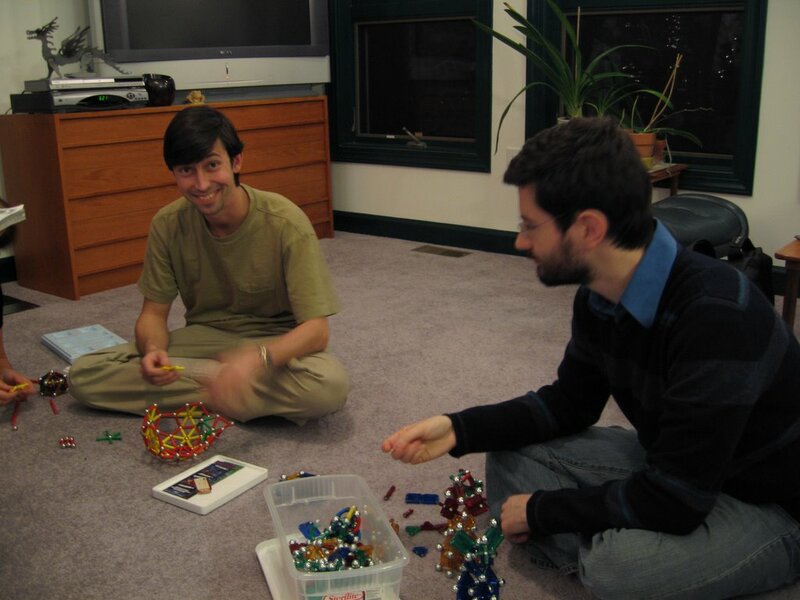 Given that I failed miserably at protecting the identity of JH last time, I'll quit worrying about it and post an unobscured photos of JH and GM. AE gave each of us guns that blow bubbles, which turn into vapor when they burst. We played with those and JH's fog ring blaster. I was nervous about having so much vapor flying everywhere in the house, but those things are very cool. Since my brother was visiting, my mom made a wonderful dinner. She made three turkey breasts, dressing, cranberry sauce, and broccoli. This time when I made rolls, the dough actually rose. At my mom's suggestion, this time I left out the 1/4 cup of water and then I didn't have to add much extra flour. We wonder if this might be necessary since the recipe was written for a higher altitude. 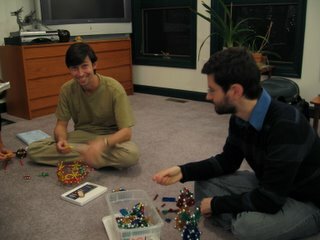 After dinner, we got back to playing with Geomags. 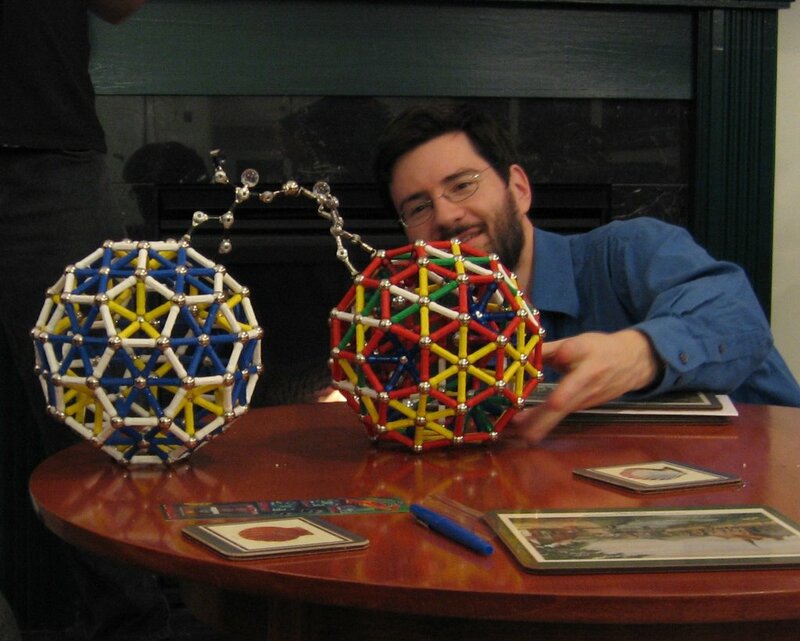 My brother, Karl, was the first to finish a buckyball, starting with an unstable base that my dad had started earlier. 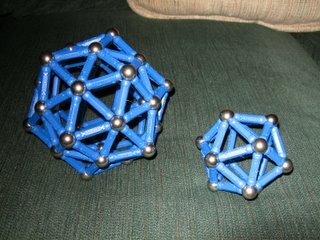 JH and IS actually ran out of pieces for their buckyball and had to incorporate some pieces from a Magnetix set. Finally, GM posed some Acrobots from ThinkGeek on top of the two balls. We watched a silent cowboys and Indians movie, made in the early 50's, starring AE's, uncle, mother and grandmother. We also saw the Wallace and Gromit shorts again, because JH hadn't seen them. Finally, we juggled! Even my dad gave it a try. We watched the contact juggling DVDs, too. 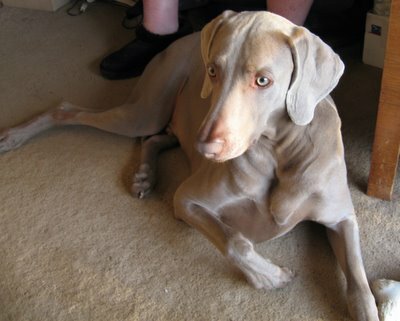 Here's one picture of FIFO that I took on New Year's Day. 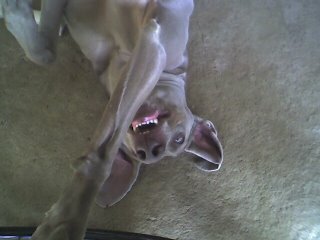 He transforms into a fierce bad rabbit when he's upside-down. The Thursday before last, my brother flew down from Boston to visit us. After work, I met my parents and him for dinner at Bullock's Barbecue. That was the start of my vacation while he was there. They now have deviled eggs as a side dish, which was very exciting. I had two whole eggs with two chicken legs and their wonderful cole slaw. I was extremely disappointed in their chocolate pie. I've been eating there for almost thirty years now and they've always had a deliciously smooth chocolate pie with meringue. The filling has always been similar to chocolate pudding, but slightly thicker. This time it had a weird consistency and wasn't very chocolatey at all. It was very sad. That Friday, I went over to my parents' to visit with the dog and everyone. We had ham sandwiches with Leerdammer cheese. I also took some good pictures of FIFO. That evening, we went to Mt. 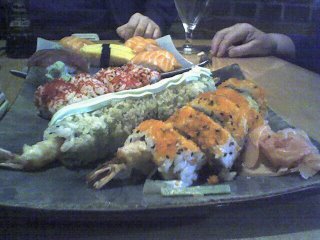 Fuji for dinner. It's funny, one review says that they "kind of wanted to take a picture of my plate". As you all know, that's what I like to do. We had a bit of a fiasco that night, because our favorite waiter didn't use his reading glasses and didn't see about half our order on our sheet. Since we didn't know what the rolls were supposed to look like, we ended up eating one of the rolls that my mom had ordered, the red NY roll in the picture. We forgot to ask for a replacement when we were getting it straightened out. Fortunately, she liked the couple of pieces of my wasabi roll that she had. I forgot to mention in my previous post that I also ordered three more Geomag sets on New Year's Eve Eve (the 30th). I found that the cheapest price for them was on eBay, from Taylor's Toys and Collectibles. I actually made my first bids on eBay for that purchase. Since no one bid against me, I got them for $40 each. It was all very exciting. On New Year's Day, I met JJ and H at Fowler's for brunch. We had a great time talking about various non-serious things. I tried their Huevos Rancheros again and it wasn't as good as last time, but it was still quite good. I don't think the avocados were ripe enough, but otherwise it was the same. That night, we tried frying chicken in my new electric frying pan. I ended up being alone with a dead (a good thing) frying chicken and I was supposed to turn it. This appears to be something that requires guidance, experience or common sense, because I didn't do it right. I didn't scrape up the skin that was stuck to the bottom of the pan, so the crust didn't turn out right and crispy at all. It was still good, but just not what we were hoping for. Next time. The next day, Monday, was extremely gloomy. We were supposed to have severe weather, but we didn't have that either. After that, it was back to work. Things were really starting to pick up before the start of the semester. One wouldn't think that professors would be preparing for their spring classes on the 2nd of January, but they are. This is particularly surprising to the daughter of a faculty member. I thought these things were always done at the last minute. The week after Christmas we ate lots of leftover turkey and I was on pager duty for three days. I only had to work for a few hours and I didn't mind at all. My pager didn't actually go off, but I had other Blackboard support duties. That Tuesday night, we watched Mr. and Mrs. Smith, which DC gave me for my birthday. I enjoyed watching it a second time and my mom didn't even fall asleep once. On Wednesday night, that week, my dad and I went to the Melting Pot, to use the gift certificate that E&ES gave us for taking care of the turtles in fall of 2004. It was pouring rain the whole way and it's in North Raleigh, so it wasn't the most pleasant drive. The food more than made up for it. We had Traditional Swiss cheese fondue for four people, one sirloin and shrimp entree (substituting more shrimp for the sirloin, since we don't eat beef) and solid dark chocolate fondue for dessert. The best part was that our waiter also allowed us to subtitute in the dessert, so we only dipped pineapple, strawberries and marshmallows! I think fruit dipped in chocolate is just heavenly. Throughout the week, we had fun with the Geomag set that JH gave me. 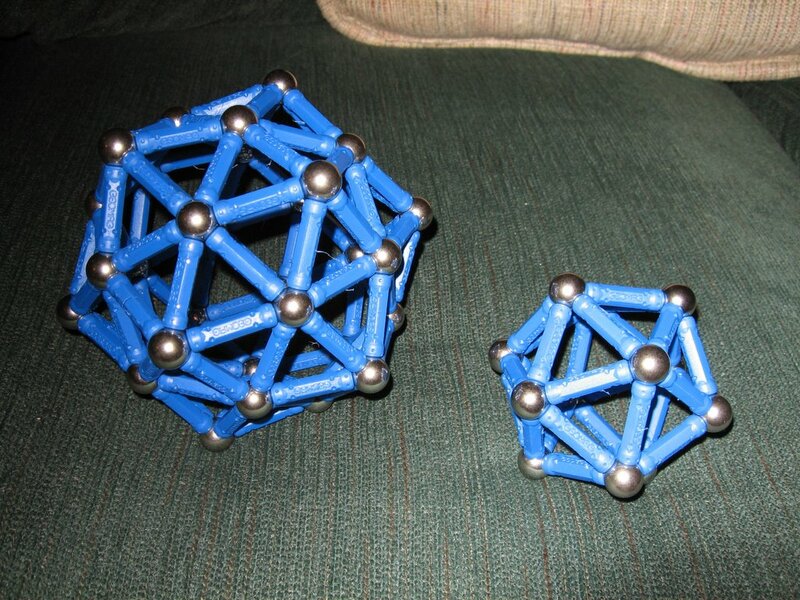 If I recall correctly, I made the pooched out dodecahedron on the left and my dad made the small icosohedron on the right. Basically, the supporting pentagon pieces had to pooch out in order for the shape to stay stable enough. They couldn't be depressed inside, because they hit each other. On Friday, my parents and I visited JJ and JA. My parents hadn't seen their new Old House before, so that was a treat for them. Their garage is so awesome and their house is really beautiful. It was fun visiting with all of them, including their beagles. 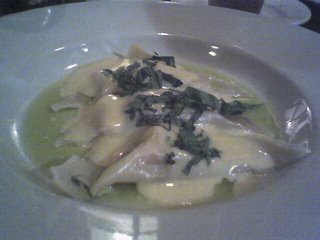 That night, my dad and I went to Vinnie's, so I could do something about my tomtato sauce withdrawl symptoms by eating a plate of four cheese ravioli with red sauce. On New Year's Eve, my dad and I watched the first half of the PBS Bob Dylan documentary, which I thoroughly enjoyed. Mom consoled FIFO during potential fireworks. We happily shared a bottle of sparkling apple cider. Happy New Year everyone! The night before our Christmas festivities, we had a glorious takeout dinner from Kurama. That was a great way to kick off the holiday. More important than any other significance of Christmas Eve was that it was the second anniversary of this blog. It was also time to set up the tree. 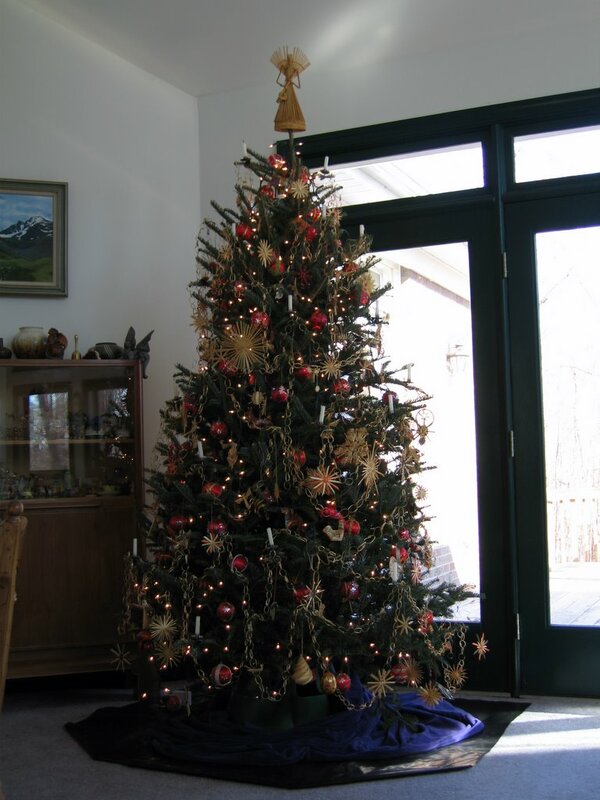 As many of you will remember, my family sets up the tree and celebrates all on the same day. This year, AE joined us, which was fun and she helped a lot with hanging the ornaments. When the tree was lit and the Bach Christmas Oratorio was playing, I took a 3 minute movie with my Canon SD500. It worked very well, but some people might get sick while watching it, given my inexperience and apparent lack of concern for steadiness. I gave my parents a hard time about the tree's having a gap because we got it so close to Christmas and there wasn't much left to choose from, but it really doesn't show from most angles, or at least this one. I got a nice selection of gifts this year, because my parents finally started getting things from my Amazon wishlist. That way I got lots of little things like CDs, chocolate covered lemon peel, an electric frying pan, a quesadilla maker and the Herbfarm Cookbook. The CDs were the complete works of Cat Stevens, 50th anniversary two album set of Jim Croce, the Clay Aiken Christmas Album and the Joan Baez album of Bob Dylan's songs. The lemon peel is not quite as good as chocolate covered orange peel, but it is excellent. I seem to eat it at about the same rate. We had an eclectic dinner that night. It included shrimp with cocktail sauce, AE's shropshire blue cheese, whole wheat French bread, guacamole and corn chips. I may have left something out, because we had a lot of food on the table. 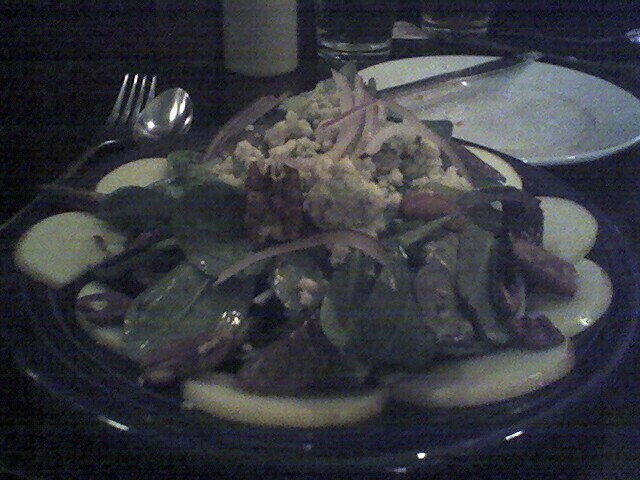 Oh yes, we had spinach and gorgonzola salad from WholeFoods. After my parents left for the night, AE and I watched a movie, the Young Visiters. Note, that is not a misspelling. It was a kind of odd British comedy that was a little sad in a way. One of the recognizable actors was Hugh Laurie, who played Wooster in Wodehouse's Jeeves and Wooster, Black Adder and is currently the star of House, which I haven't seen. It was pretty obvious that I'm not used to having house guests. I had been talking to AE in the hall and then I started shutting off lights in the great room. Just a couple of minutes later, she popped her head around the corner and said something. I nearly jumped out of my skin. I got used to it after a couple of days, but it was pretty funny. Christmas Day is just a day of recovery and food for my family. Dad and I made his crepe style pancakes. This time we put big chunks of fresh pineapple drizzled with semi-sweet chocolate in them. It was very good. In the afternoon, AE and I watched the three original Wallace and Gromit movies and I made rolls. They didn't rise for some reason. I don't know if I added too much flour, killed the yeast or both. They ended up being delicious anyway. I also made a Constant Comment spice cake, which was on the back of the Constant Comment box. 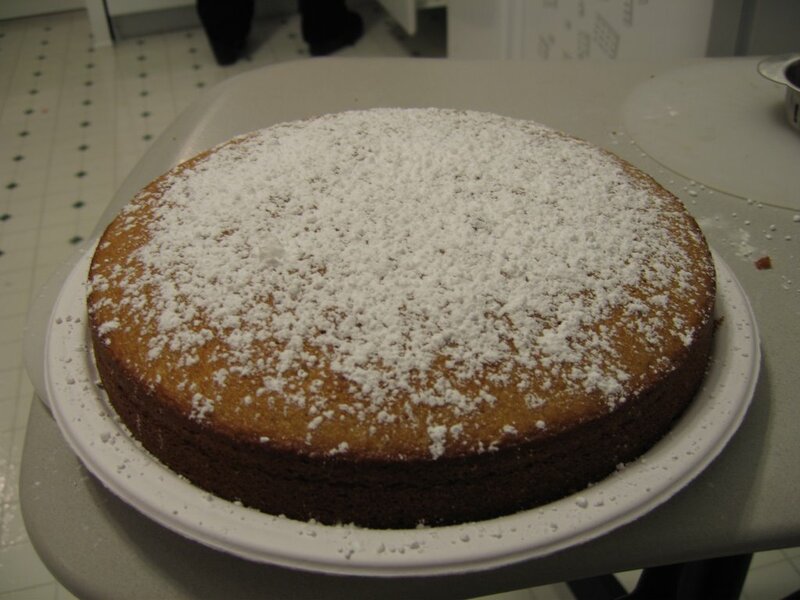 Basically, you cook five tea bags in a half cup of milk and add it to the rest of the cake batter. I used decaf, because I didn't want to worry about when I ate it. It's good, with a subtle spiced flavor, but it's not spectacular. We still haven't finished it, so I'll be surprised if I make it again. I'm tempted to make it with Red Zinger instead, but that could be very strange. I did think it was very pretty, as you can see. Dinner was very good, because my mom made a turkey breast, dressing, gravy and asparagus. The dressing was some of the best she's made in years. She had been concerned, because WholeFoods only had the whole wheat French bread, but it was perfect. The next day, AE and I spent most of the day washing dishes. She did the drying and I did all the washing, which seemed ideal and very efficient. Then we watched new version of Charlie and the Chocolate Factory. I wasn't sure how excited I was about seeing it again, but it was definitely a good movie. I really do like the scene with the squirrels. It was especially good, because I could see squirrels out of windows on either side while I was watching it.